A chlorinator is an Appliance like any other Appliance within your household. It has to be treated and cared for as you would you washing machine, tumble drier, fridge, etc, they all have a specific function and run off electricity, JUST like ours!. The pH is an important part of water chemistry. The effectiveness of the Sanitiser you are using depends largely on the pH of your swimming pool water. However, the TOTAL ALKALINTY of your pool plays a large part in how stable the pH will be. It is a known industry fact that Total Alkalinity keeps the pH from fluctuating high or low; commonly know as “bounce”. The chlorine gas produced by the chlorinator needs protection from the ultra violet rays of the sun. In the absence of Stabiliser, the chlorine produced will be rapidly dissipated into the atmosphere, giving the impression of zero chlorine reading in the water. Adding the right amount of stabiliser will enhance the effectiveness of your pool sanitizer. Stabiliser effectively prolongs the active life of the produced chlorine, allowing sanitization to take place. After the initial dosing of salt and Stabiliser, top up quantities should only be required when the pool water is diluted with fresh water. This will only occur after rain, or additions of water by the pool owner. Test your pool water for salt and Stabiliser (ISO Cyanuric Acid) levels before adding these two chemicals. Other chemicals should be added as indicated by pool chemical test. Pool chemical status should be checked at least once a week during summer months. All chemicals should be added in small quantities, checking the chemical change after each addition. Following this procedure saves using excess chemicals and the problems associated with correcting such errors. The advantage of a chlorinator is that the chlorine produced inside the chlorinator cells is pure chlorine. This allows you to eliminate the fillers and additives in over-the-counter chlorine that usually irritate your skin and eyes. This unit is designed to operate in one direction (unidirectional), the electrode will have to be cleaned on a regular basis. J100 units are for pools with a volume up to 60 000 litres in capacity. Self Cleaners operate on a reverse polarity process (bidirectional) utilising the main pump timer to facilitate this switching process, namely; every time the timer switches OFF the pump and chlorinator, the chlorinator internally changes its polarity and on re-energisation for the next cycle, operates in reverse cycle. This process facilitates the self cleaning process. During this cycle, one will observe that the calcium built up (white chalky deposit) on the one set of electrode plates, will be shed and seemingly transposed onto the opposing set of plates. 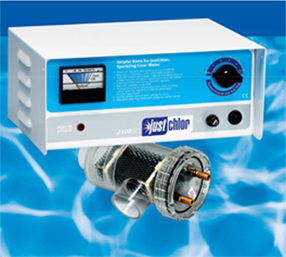 J200 Units are typically used for pools that have a volume of between 60 000 and 120 000 litres in capacity. Self Cleaners operate on a reverse polarity process (bidirectional) utilising the main pump timer to facilitate this switching process, namely; every time the timer switches OFF the pump and chlorinator, the chlorinator internally changes its polarity and on re-energisation for the next cycle, operates in reverse cycle. This process facilitates the self cleaning process. During this cycle, one will observe that the calcium built up (white chalky deposit) on the one set of electrode plates, will be shed and seemingly transposed onto the opposing set of plates.